2. Heat up onions for the Hash in a sauce pan and sautee for 5 minutes. Add in potatoes, oregano, and chipotle chilli powder. Cook on medium heat for 10-15 minutes. 3. 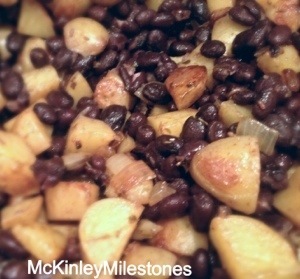 Heat up 2 cans of black beans in a separate pot. Once cooked, place them in with the potatoes. 4. 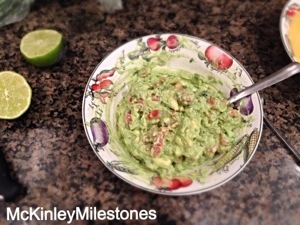 Meanwhile, put all the guacamole ingredients into a bowl and mix together. 5. Heat up eggs in a skillet and scramble them. 6. Once everything is cooked, take a Wet a paper towel and place it on a microwave safe plate. Place big pieces of collard greens (4 at a time) on plate. Then top them with another wet paper towel. Microwave for 1 minute. 7. 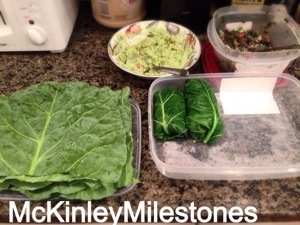 Put ingredients into the collard green: Potato Hash, Scrambled egg, guacamole, and salsa- then wrap up! Next Post “Most Influential Blog” Award! Yum. I’ve never had collard greens before. This Wende gotta try. More recipes for your family that are easy!